Very Important “All Hands In” Parent/Booster Meeting This Week…. WE NEED YOU!!! The boosters also have a busy week ahead of them as we host a required parent/booster meeting to discuss our Legacy of Champions (LoC) marching band competition that will be hosted here on the Carrollton City Schools campus on Saturday, October 8th, 2016. The parent/booster meeting will be held this Thursday, August 25th, from 6:00-7:00 p.m. in the band room. We request that all parents, guardians, and willing supporters/alumni join us as we provide details about this year’s event, the importance of and expectations regarding parent volunteer support, the various volunteer needs for that day, and an opportunity to help match volunteer talents and interests to our list of available jobs. We will also be detailing how you can become a “Rockstar Volunteer” by committing to three or more shifts, or the whole day for the LoC. 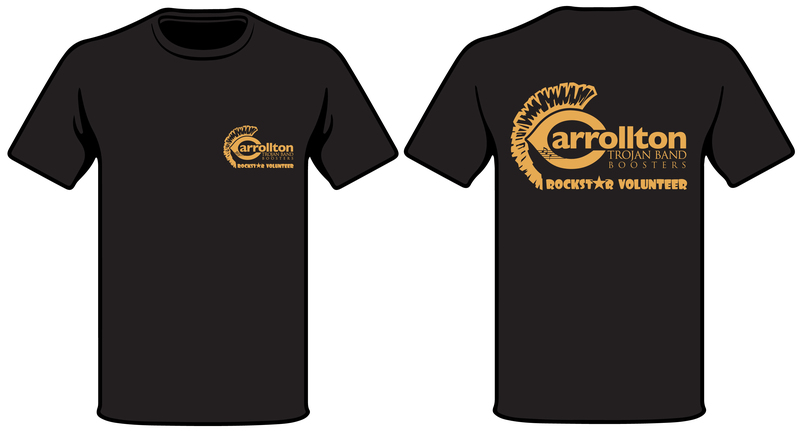 Rockstar Volunteers will receive an exclusive t-shirt, a free meal voucher for use during the LoC, recognition on our website, special recognition by our announcer at a home football game, as well as being part of an exclusive pulling of our large American Flag in honor of our Rockstar Volunteers at a football halftime ceremony. There is a large selection of duties to choose from and training will be provided before LoC, so please review the list on our Volunteer Page and commit to supporting the success of this wonderful event, our children, and our great CHS Band Program. Our LoC Committee will be available at the meeting to answer questions you might have. See you at the meeting and thank you for supporting your children. If you have any questions prior to the meeting, please make sure to contact the Band Boosters at: chstrojanbands@gmail.com. Posted in CHS Band, Legacy of Champions and tagged #trojangold, #trojansallin, Carrollton High School, Carrollton High School Band, Carrollton Trojan Band, Carrollton Trojan Band Boosters, CHS Band Program, Gold Standard, Legacy of Champions, Marching Band Competition, Trojan Band Boosters on August 21, 2016 by CHS Trojan Band. ← It’s Time… Let The Season Begin!